If your rug is in an area that is seldom walked upon, such as under a sofa or bookcase or hung on a wall, there is a possibility of moth infestation. For circumstances such as these, we recommend that your rug be washed and mothproofed. 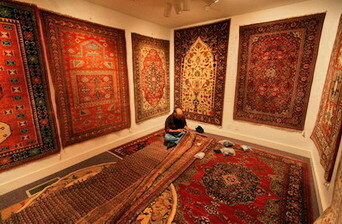 Rudy repairing rugs in The Magic Carpet. If your rug has to be stored for any extended period of time, we strongly suggest that it be cleaned and mothproofed as a dirty rug provides an attractive home for wool-eating insects. To store, roll the rug against the nap into a tight cylinder and wrap it with heavy brown wrapping paper. Do not use plastic which may cause the rug to mildew. Store in a dry, cool, well-ventilated area to avoid mildew and heat damage. For added convenience, the Magic Carpet can wash, mothproof and wrap your rug for you.